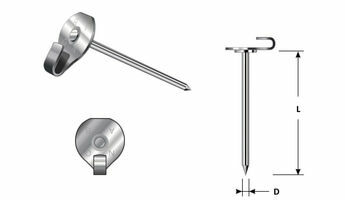 Lacing Anchors are used in the fabrication of insulation blankets or removable covers/pads. The nail is pressed through the insulation material, so the hook portion sits on the top edge and the nail is secured on the opposite side of the insulation with a washer. The two sides of the blanket can then be “laced” together by the hooks with tie wire. 14 ga (.080) 7/8" 2-1/2"
14 ga (.080) 7/8" 4-1/2"
12 ga (.106) 7/8" 2-1/2"
12 ga (.106) 7/8" 4-1/2"